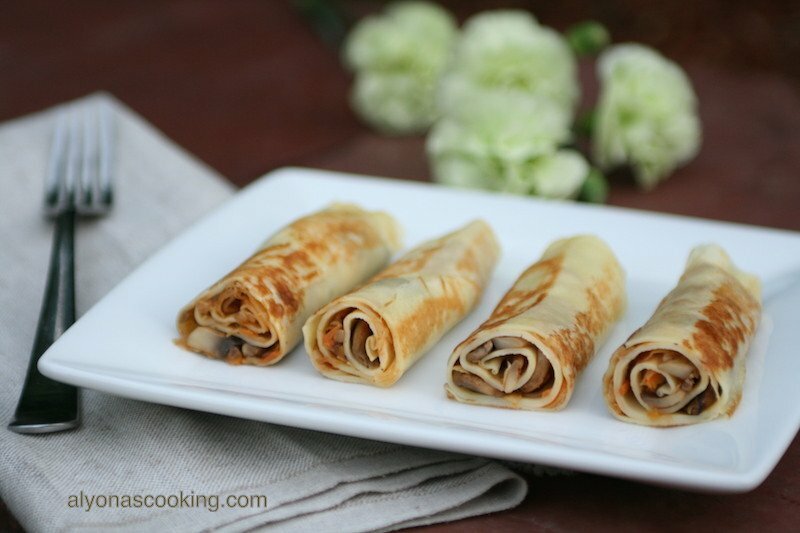 These delicious crepes are filled with a sweet and tangy filling. 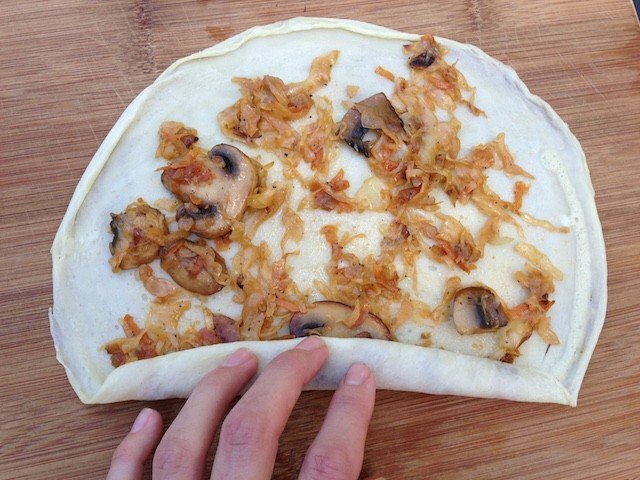 The mixture of the slightly sour cabbage and sweet mushrooms, make for a wonderful combination in flavors. The delicate yet firm crepes are then toasted lightly until golden. 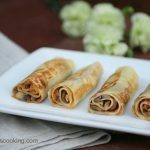 They can be eaten cold or warm and taste amazing even without toasting.As mentioned before my crepe recipe was given to me by my aunt who makes amazing crepes. 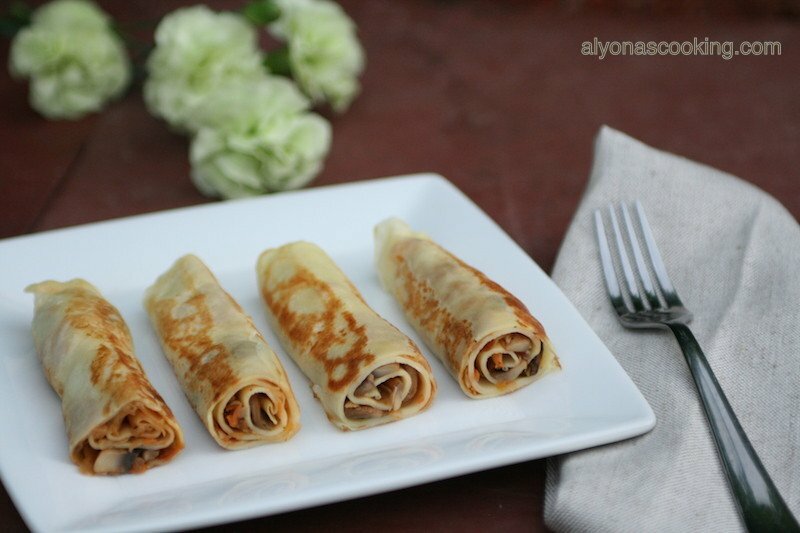 If you’re interested in the crepe recipe just click here. However we’re just going to jump in to the delicious filling. Of coarse you can use your favorite crepe recipe just cut down on the amount of sugar to no more than 2 tbsp as we don’t want overly sweet crepes for this filling. 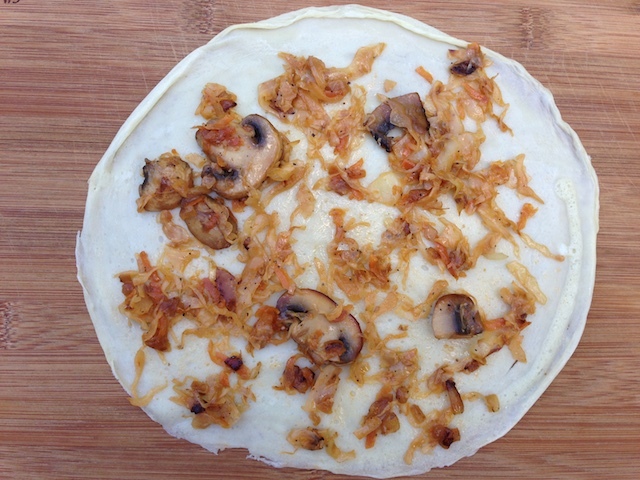 This recipe uses freshly shredded cabbage and requires no sour kraut, however if you happen to have left over braised cabbage that you want to use up, go right ahead just sauté the mushrooms and onion; season and add to the cold braised cabbage blend. Try this cabbage blend filling the next time you want to make crepes and serve this dish as a side, appetizer or even as a main entree. Enjoy! Wash and finely shred the cabbage into a large bowl. Peel and wash a carrot and grate into the cabbage. 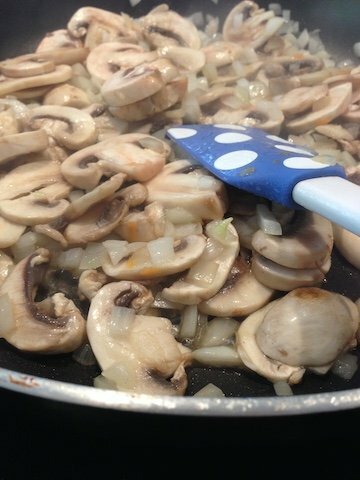 Wash the mushrooms and slice; set aside. Dice the onion;set aside. Heat two large non-stick skillets over med-high heat; add 3 tbsp of oil to both frying pans. 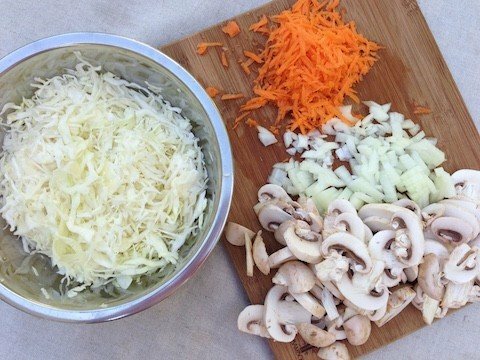 Add the cabbage and carrot mixture to one skillet and the mushroom and onion mixture to the other skillet. 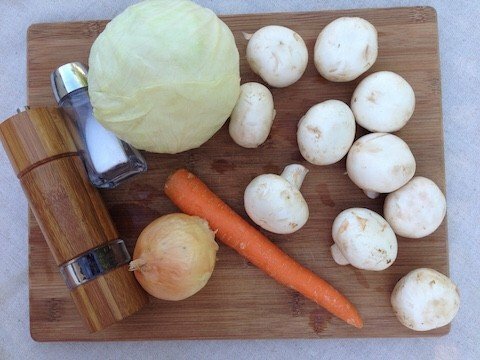 Sauté both mixtures until they have reduced in size and cabbage has browned slightly. You may need to add a few tbsp of oil in between frying to prevent any sticking. After both mixtures have sautéed for some time; add the mushroom and onion mixture to the cabbage sauté and season with ketchup, sugar, salt, ground pepper and vinegar. Sauté the combined mixtures for an additional 10 min or so. Sauté should have browned much in color. Transfer mixture to a heat-proof bowl and cool. 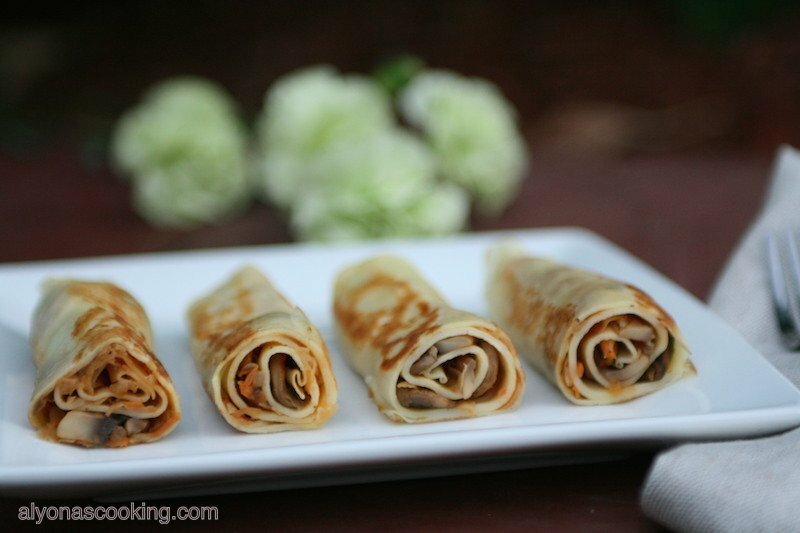 Fill each crepe with about 1/4 cup full of the cooled mixture. Spread mixture over the crepe leaving a little room near the borders. Roll up and set aside. Heat a non-stick skillet over med-low heat. Add 1/2 tsp of oil and toast all sides until golden; remove cool and slice crepes in half. Serve warm or cool. Wash and finely shred the cabbage into a large bowl. 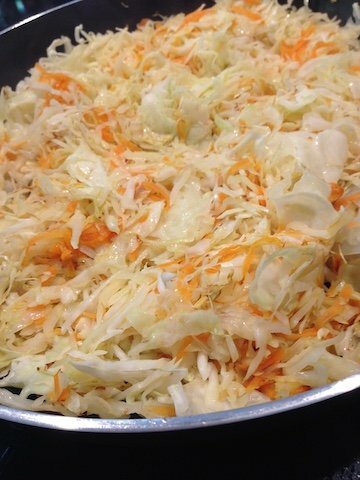 Peel and wash a carrot and grate into the cabbage. Wash the mushrooms and slice; set aside. Heat two large non-stick skillets over med-high heat; add 3 tbsp of oil to both frying pans. 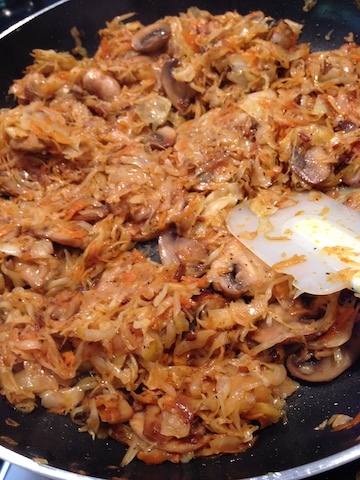 Add the cabbage and carrot mixture to one skillet and the mushroom and onion mixture to the other skillet. Sauté both mixtures until they have reduced in size and cabbage has browned slightly. After both mixtures have sautéed for some time; add the mushroom and onion mixture to the cabbage sauté and season with ketchup, sugar, salt, ground pepper and vinegar. Sauté the combined mixtures for an additional 10 min or so. Sauté should have browned much in color. Transfer mixture to a heat-proof bowl and cool. 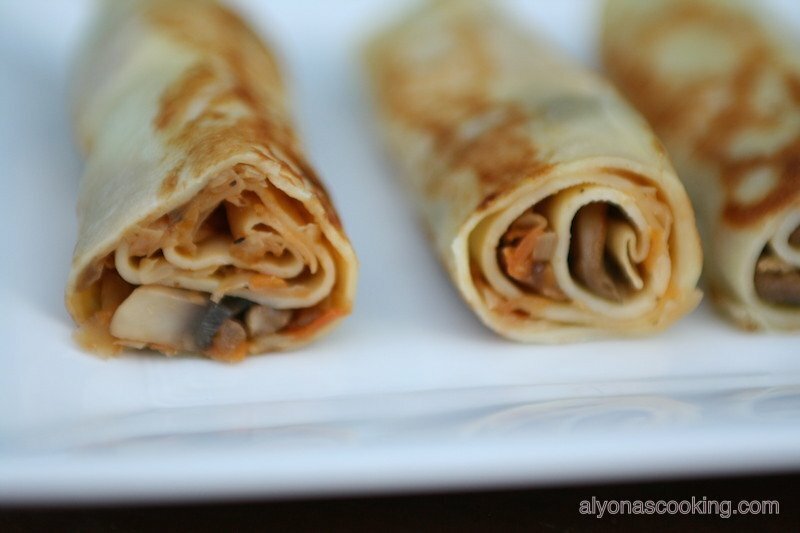 Fill each crepe with about 1/4 cup full of the cooled mixture. Spread mixture over the crepe leaving a little room near the borders. Roll up and set aside. Those look absolutely delicious by the way. I’m gonna make those. I can’t wait. Certain dishes I already know I’d enjoy even having never tried them. These are one of those.